Receiving a serious diagnosis can be life-changing. Patients and their caregivers can help take control of their treatment and care options by learning everything they can about their diagnosis, which includes laboratory and pathology results. Patient Champions not only advocate for themselves, they share what they’ve learned to empower others to do the same. This program focuses on teaching patients and caregivers about the laboratory so they can better understand their options and choose the treatments that work best for them. Empowered patients are essential to create optimal health care worldwide. Cindy was ASCP’s first Patient Champion, an ambassador to empower and educate patients and raise awareness of the crucial role the medical laboratory plays in patient care. Through her story, Cindy has empowered other patients to ask the right questions and understand their treatment options. Cindy was also an inaugural member of the Patient Champions Advisory Board and served on that Board until her passing. Cindy was the first to receive the ASCP Patient Champion Award in September 2017, presented by ASCP Chief Executive Officer E. Blair Holladay, PhD, MASCP, SCT(ASCP)CM, and ASCP Patient Champions. This award recognizes a Patient Champion who has gone above and beyond in his/her activities to increase awareness of the laboratory. Cindy was passionate about service, volunteering, and her work as a laboratory professional. 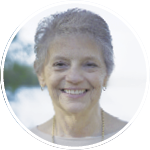 She was an active volunteer for ASCP and the laboratory profession throughout her career. "Take control of your own situation. Do research to learn what questions to ask. Find people to help you. Do not let anyone tell you that this is the way it is and you just have to do it." "Write down everything your doctor tells you, so even if you don’t assimilate it at the time, so you can review the information later to make sure you understand." "Always get a copy of your lab results so you know if something has changed. One of the most important things to do is to ask questions. Write them down before you get to your doctor’s office to make sure you cover everything you want to know." "Never feel like you’re taking up too much of your doctor’s time." Watch Cindy talk about the role the laboratory played in her fight against cancer. Prodigy isn’t a word to be thrown around lightly, but for Hudson High School student James, the moniker fits. He started playing piano when he was three years old, and before long he was winning local, national, and international piano competitions. James has played piano in venues all around the world, including Carnegie Hall and the Kennedy Center in New York City. The vision he had for his life included upward trajectories in his music and academic careers, but it didn’t include cancer. Of course, illnesses rarely take our wishes into account. 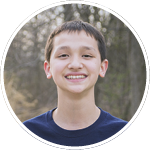 When he was 13 years old, James began experiencing extreme abdominal pain. His doctors identified a tumor outside his bladder, and biopsies were taken. Members of the lab team as well as pathologists across the United States collaborated on a final diagnosis: a rare form of aggressive bone and tissue cancer called Ewing Sarcoma. 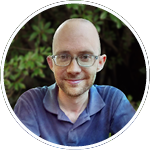 James struggled with several side effects of chemotherapy such as hair loss, pain, and muscle weakness. Before his diagnosis, he played baseball and basketball; during his treatment, he had to give them up. Perhaps worst of all, James lost the feeling in his fingers, and with it, his ability to play piano. After nearly three months of chemotherapy, he was declared cancer-free and the feeling in his fingers returned. James and his family navigated their journey with faith and hope. They also learned the value of the laboratory team. 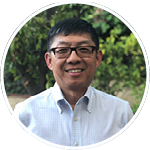 In fact, James volunteers at pediatric cancer awareness events so he can promote the role laboratory professionals and pathologists play in cancer diagnosis and treatment. He also continues to study piano so he can positively impact others through his music. "Stay positive by thinking in the long term and not the short term. There is always a chance you are going to get through it no matter what." "There are caring individuals who are tirelessly working to assist you and other patients." "Maintain faith and hope. Allow others to help you. Ask questions about your condition without hesitation. Look to learn." "For caregivers, learn as much as you can and all the questions that your charge might not think of." "Educate yourself, ask questions and strive to understand every test and everything that is being said. Don’t be intimidated or embarrassed to ask questions or share your concerns with the medical team." "Take care of yourself and your needs. Doing so will give you strength to focus on the task at hand and deal with emotional moments with clarity." "Ask for help when you need it. You may think you’re being a burden, but in reality, your friends and family want to do what they can to help you. Giving people a chance to help you will strengthen your connection with them." "Be honest about your feelings. My husband and I were able to maintain ourselves in a good mental state throughout our challenge because we had each other to spill all of our complaints and feelings to without any hesitation." "Pay attention to your other children and their needs. When one child is sick, the other children’s lives are affected too. It’s easy to overlook their struggles." "Share your child’s updates with family and friends. They’re worried about your family. Use social media to spread news, or designate a friend or family member to do so on your behalf." "Finally, one size doesn’t fit all. As each child and family is different and unique from others, some suggestions and coping strategies won’t fit your life style, and that’s okay. The most important thing to do is maintain hope." Noted piano prodigy, James was diagnosed with Ewing Sarcoma when he was 13 years old. After almost three months of intensive chemotherapy treatments, he was declared cancer-free. Today, James promotes the role laboratory professionals and pathologists play in cancer diagnosis and treatment. Ewing Sarcoma is a rare form of aggressive bone and tissue cancer. This cancer occurs in young adults and children and, if diagnosed early, has a survival rate between 59-70%. Once the cancer has metastasized, meaning that it has spread to different parts of the body, the survival rates drops. It is diagnosed through a biopsy, as seen below. A pathology slide of Ewing Sarcoma which shows the dark, round cells typical of this tumor. Are you interested in highlighting the story of James through a media story or speaking engagement? Contact Lotte Mulder at Champions@ascp.org. 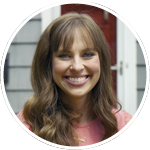 Erin was first diagnosed with papillary thyroid carcinoma when she was a senior in college. A nodule found in a routine gynecologist’s appointment prompted her doctor to order an ultrasound and a fine needle biopsy. When cancer was diagnosed by a pathologist, Erin had surgery to remove her thyroid and two cancerous lymph nodes. Following her college graduation, she received radioactive iodine treatment and was given a clean bill of health. When Erin was pregnant with her son eight years later, her hormone levels were monitored at a high-risk clinic. An ultrasound revealed three suspicious lymph nodes; subsequent on-site analysis by a pathologist revealed recurrent papillary thyroid carcinoma. While Erin had surgery to remove two cancerous lymph nodes, her carcinoma tested positive for a BRAF mutation, which means the cancer would be less responsive to the radioactive iodine treatment and more likely to recur in the future. Erin’s doctors continue to monitor her cancer growth every six months through a combination of blood tests and scans. Erin’s husband, Cody, is a pathologist and has deepened her understanding of the nature of her cancer and the diagnostic role the pathologist and laboratory team play in care and treatment planning. She has a great appreciation for the many doctors and clinicians that work behind the scenes on her behalf. Erin has worked in the commercial furniture and design industry since graduating college and now stays home with her son, Luke. She enjoys designing, crafting, watching movies and spending time with her husband and son. Papillary Thyroid Carcinoma is a type of cancer of a large gland (the thyroid) in the neck. Not everyone has physical symptoms, but some people might notice a lump in their neck. It is diagnosed through blood tests and biopsies performed by laboratory professionals and pathologists. Metastatic papillary thyroid cancer means that the cancer has spread beyond the neck gland into other areas of the body such as the lymph nodes. Below is a slide of a biopsy used to make the diagnosis of papillary thyroid cancer. A pathology slide of Papillary Thyroid Carcinoma showing dark blue, crowded cells creating tufts or fronds into clear spaces is typical of this tumor. Are you interested in highlighting the story of Erin through a media story, event or speaking engagement? Contact Lotte Mulder at Champions@ascp.org. Growing up on a farm in rural Minnesota, Kya embodied what it means to live an active lifestyle, playing year-round sports like tennis, hockey, and baseball, and working through farm chores and tossing hay bales. But at the age of 16, a routine laboratory test showed the self-proclaimed social butterfly had abnormally low blood counts, putting her at a higher risk for bleeding—and putting a hold on her beloved activities. “After I was diagnosed, I had to change my lifestyle from very active to very sedentary,” Kya says. “This wasn’t by choice, but as my body gradually got weaker, I couldn’t keep up with my preferred lifestyle.” Physical activities became arduous, she says, and simple things she once took for granted, like walking up a flight of stairs, became impossible. And as she moved to be closer to her specialist, keeping up her active social life also became more trying. “My world was flipped upside down,” she says. Thankfully, one of Kya’s sisters was a perfect match, and Kya received a bone marrow transplant in 2010 at the age of 17. Before her diagnosis, Kya had a positive view of the laboratory—her mother is a laboratory professional and often shared her love of her job with her family, and Kya has fond memories of begging to go to work with her mom so she could peer into the microscopes. And after her diagnosis, Kya realized just how big of a role the laboratory played in patient care. Thanks in part to her post-transplant monitoring, Kya recovered and enrolled in college in 2011. After laboratory tests showed that the first transplant was failing, she underwent a second transplant in 2013. Today, Kya is healthy and keeps her ever-positive outlook on life. “Part of my Aplastic Anemia journey was having the opportunity to ask myself what I am truly passionate about and not just what seemed like a logical career path,” Kya says. “My passion? Television! I admire every part of it, and every person in every position that comes together to create a masterpiece.” Working toward her passion, Kya is excited to start her career in the television industry, knowing that her Aplastic Anemia diagnosis is only one piece of her story. "Think of your diagnosis as a piece of your story, not a setback in your story. In the words of my beloved care team: This is a speed bump in your highway of life. Keep track of your test results so you can see how your levels are changing or improving." "Take care of yourself. It is okay to take a semester off of school if you need in order to heal and recover. I took time off during college after my second bone marrow transplant and it allowed me to come back even stronger. Now I am about to graduate in May!" "The lab results and tests might seem intimidating but remember you can always ask questions. Why was this test done? What does this test mean? What does this change in results mean?" "Caregivers are special people. They are guardians of and advocates for patients. As a caregiver, don’t be afraid to ask questions and explore every single option." Kya was diagnosed with aplastic anemia at 16, a condition where bone marrow stops making enough new platelets and white and red blood cells. Kya received two bone marrow transplants and underwent intensive chemotherapy before each transplant to eliminate her own cells. Kya is sharing what she learned about the laboratory to empower other patients. Aplastic Anemia is a condition where bone marrow stops making enough new blood cells. This condition is chronic, but there are available treatments such as medications, blood transfusions, and bone marrow transplants. Aplastic Anemia is diagnosed through blood tests and bone marrow biopsy. Below is an image of Aplastic Anemia under a microscope. A pathology slide of Aplastic Anemia which contains very few cells (dark blue spots). Normally, bone marrow is filled with many different cells. Are you interested in highlighting the story of Kya through a media story, event or speaking engagement? Contact Lotte Mulder at Champions@ascp.org. DeeDee's life has been about helping others. She is the Executive Director of Ironstone Farm, a non-profit organization in Lowell, MA, that provides one of the largest equine therapy programs in the United States for people with disabilities and illnesses. She was the primary caretaker for her mother when she was diagnosed with Chronic Lymphocytic Leukemia (CLL), and she assumed care for her friend and business partner Richard Donovan as he experienced cognitive and physical deterioration. She became the public member of the Board of Governors at the Board of Certification at the American Society for Clinical Pathology in 2007. As it turned out, all these experiences helped inform her response for these three life-altering diagnoses: renal cell carcinoma in 2007, a non-malignant meningioma brain tumor in 2009, and CLL in 2017. Over the course of managing care for others and herself as well as volunteering for a laboratory medicine organization, DeeDee not only learned about the importance of laboratory results but the dedication of the people who provide them. While most people never come in contact with the laboratory professionals and pathologists that are responsible for their results, DeeDee is aware that these people work tirelessly behind closed doors to ensure accurate results and diagnoses that affect patient’s lives. During each of her diagnoses, she learned as much as possible about the disease, including asking questions about her laboratory results until she fully understood the answers. It’s her wish that the general public be educated in the role of the laboratory and its value in every aspect in healthcare. This education includes access to laboratory results as well as access to pathologists and tours of the laboratory. Living with each of her diagnoses has given DeeDee clarity of purpose. Before, work consumed her life. While her work with Ironstone Farm is still an integral part of her life now, she recognizes the value of truly experiencing life. She takes the time to eat right and get enough sleep. She spends time with people she loves, she’s learning to dance, and she’s recently traveled to Israel and Italy. Her life is fuller than it’s ever been before. While DeeDee wasn’t unsurprised by her Chronic Lymphocytic Leukemia diagnosis—her mother and brother had also battled the disease, and she was experiencing symptoms—the conversation felt surreal. Throughout her and her family’s illnesses, she learned to ask questions about laboratory results. Now she’s paying those lessons forward. "Fight the battle as hard as possible." Learn as much about the disease and its treatment options. Ask for specific diagnostic tests. Don’t leave the doctor’s office until you fully understand your lab results. Reach out to other people with your diagnosis. Ask for second and third opinions. Don't be afraid to travel if it means getting the best care from the best people. "Involve your family and friends." Share your anxieties and feelings with them. You are not alone and their support will help you heal mentally and emotionally. Understanding that your diagnosis hurts your loved ones, too. Use this as an opportunity to become closer, not as a wedge to drive you apart. "Channel your heightened emotions into positive actions." "Be grateful, not resentful. Take this opportunity to enhance everything positive in your life." "If you can survive emotionally and mentally, then you have won." "Care for your family members." Humor is the most important gift you can give. Be their advocates in the healthcare system. Talk with them about their test results, not around them. Ensure that friends and family spend time with their loved one. Take care of yourself. A healthy lifestyle benefits you both. Deedee was expecting a diagnosis of chronic lymphocytic leukemia because her mother was diagnosed with this type of cancer and her brother has been diagnosed as well. Nevertheless, it was quite a shock to hear the diagnosis. Through taking care of her mother, Deedee learned to ask questions about lab results. She is now paying those lessons forward to other patients and caregivers. Chronic Lymphocytic Leukemia, or CLL, is a form of blood and bone marrow cancer. It typically affects older adults and people may not have symptoms for years, which is why laboratory testing is essential. CLL is diagnosed by a routine blood test that is analyzed by laboratory professionals and confirmed by a pathologist. Below is an image of what CLL looks like under the microscope. A pathology slide of Chronic Lymphocytic Leukemia which shows blue “soccer ball” cells, typical of this tumor. Are you interested in highlighting the story of Deedee through a media story, event or speaking engagement? Contact Lotte Mulder at Champions@ascp.org. While she didn’t have a name for her condition, Jasmin endured symptoms her entire life. She spent a lot of time getting shuffled to different specialists who inevitably couldn’t give her answers. After several doctors and dozens of negative laboratory results, she began to wonder if her symptoms were “all in her head.” Thankfully, Jasmin majored in Clinical Laboratory Science at Winston-Salem State University. Once she learned about different aspects of laboratory testing, she suggested tests for her doctors to order. Working together, they made a diagnosis: Behçet’s disease, an inflammatory disorder that typically affects those living in the Middle East or Far East. Jasmin received her diagnosis the day before her 25th birthday. While she felt relieved to finally have a name for all her symptoms—she wasn’t imagining things, after all!—she was also scared. She learned to live with Behçet's disease one day at a time, even if some days she embraces it and others she's angry at the world. Over time she’s discovered having a positive outlook, a solid support group, and advocating for others helps her achieve her dreams. Currently, Jasmin is writing a book about her journey and launching a non-profit called Noire Health and Wellness dedicated to educating and helping others. She’d like everyone to know that individuals diagnosed with illnesses aren’t just patients—they’re people, first and foremost, and compassion goes a long way. She looks forward to educating the public about the medical laboratory team and their role in diagnostic medicine. "The lab is a very important aspect in your heath care. Your lab results help determine your diagnosis and treatment options." "A positive outlook and a strong, solid support group is everything. Take it one day at a time. " "You are NOT your diagnosis. It may feel like the end of the world, but I promise you it’s not. I’m a living testament to that." "For caregivers: remember that patients are first and foremost people. Every patient is different and may not fit the routine case." "Think about what’s best for that patient and not necessarily what you believe is best." "Compassion goes a long way, especially if you are delivering a diagnosis that is life changing or terminal." "Also, remember most of us are not well versed in medical jargon. Talk to us like normal individuals. Those terms can sound extremely scary to the average person." Jasmin received her diagnosis of Behçet’s disease the day before her 25th birthday. Behçet’s disease is a rare inflammatory disease in blood vessels. Jasmin majored in Clinical Laboratory Science and is now working to educate other patients. Stay tuned for this developing story! Behçet's is a rare inflammatory disease in the blood vessels. It is a chronic illness, but there is treatment to make people more comfortable. Behçet's can create ulcers, rashes, sensitivity to light and heat, and pain in the joints or eyes. It is diagnosed through blood work and tissue biopsies analyzed by the medical laboratory team. Are you interested in highlighting the story of Jasmin through a media story, event or speaking engagement? Contact Lotte Mulder at Champions@ascp.org. Growing up in a family with ten kids meant that Anthony Loria didn’t get a whole lot of privacy. Even so, when he started experiencing diarrhea, fatigue, and intense abdominal pain when he was 12 years old, he hid his symptoms from his siblings, parents, and doctors. Through adolescence he learned to deal with the cyclic nature of the illness: months of symptoms followed by a few days or weeks without pain. The symptoms would always return, however. While his parents encouraged him to socialize, Anthony never wanted to be too far from a bathroom or his bedroom. Eventually his life became nothing but school, studying, and hiding his symptoms. As neared graduation, he knew he’d have to tell his parents about what was happening to him if he hoped to make it in college. That’s when he learned he had Crohn’s disease. Before his diagnosis, he was just trying to survive; afterward, he started living life. After corticosteroid therapy and surgery effectively controlled his disease, Anthony went to George Mason University, where he became a scholarship athlete, enjoyed social activities, and decided to go to medical school. 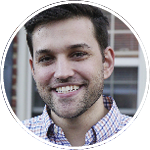 When he was diagnosed, Anthony researched his condition, including the significance of laboratory test results. He realized essentially all the data that guides his therapy and allows him to live his life—such as biopsies, routine blood work, and blood transfusions—is a direct result of the work laboratory professionals and pathologists do. His appreciation for the laboratory grew even more—every pathologist he met cared deeply for patients and their care. He hopes to be a colorectal surgeon one day, and looks forward to working with pathologists (“the doctor’s doctor”). He would like patients to take the time to meet and talk with pathologists and laboratory professionals in the course of their care. "For patients and caregivers, take time to meet and talk with some pathologists." "Pathologists care deeply for patients and love to share their knowledge." "Interacting with the medical laboratory team on a personal level has helped me get a better insight into their role as "the doctor's doctor." "Be careful what you read on the internet. The majority of patients who are doing well don't go to forums or post online. They're busy out living life, which you should be doing as well." "Your diagnosis is a small portion of your life, that at times demands significant attention. Remember you are a friend, student, colleague, etc. You are more than your diagnosis. Caregivers must speak up. You know the patient better than anyone on the care team. If something is not right, trust your gut and mention it. A good doctor will recognize and value your insights." Anthony started experiencing severe abdominal pain when he was 12 years old. Because he felt embarrassed, he did not confide in anyone until he was 18. Shortly thereafter he was diagnosed with Crohn’s disease, a chronic inflammatory bowel disease. Anthony now shares his story to increase awareness of this disease and to encourage others to speak up as well. Crohn’s Disease is an inflammatory bowel disease that causes abdominal pain, weight loss, diarrhea, anemia, constipation, and fatigue. It is a chronic condition, but symptoms can be managed through medications. Crohn’s is diagnosed through blood tests and biopsies. A pathology slide of Crohn’s Disease shows disorganized and misshapen glands lining the intestine, typical of this disease. Are you interested in highlighting the story of Anthony through a media story, event or speaking engagement? Contact Lotte Mulder at Champions@ascp.org. Married to a surgical pathologist and with a 25-year career as a nurse, Laurel is very familiar with the role laboratory professionals and pathologists play in healthcare. When she was diagnosed with Hepatitis C in 1990, that familiarity became personal. Before her diagnosis, Laurel balanced her nursing career with raising two children, and playing the occasional round of golf. But after her diagnosis, she was terrified: would she live to see her children get married? Would she meet her grandchildren? Laurel used her medical education to combat her anxiety. She learned everything she could about Hepatitis C so she’d be able to ask the right questions and became her own advocate. She had to consciously work to stay positive while living with the uncertainty a diagnosis of Hepatitis C brings. Fortunately, some of that uncertainty has been replaced with relief and gratitude. Laurel received a liver transplant in 2011, and thanks to science and research, was cured of the virus in 2012. Now, with her future ahead of her, she’s found another passion in advocating for others and helping friends and family navigate the sometimes unwieldy world of medicine. She encourages everyone to ask about their lab results and pathology reports so they can understand what they mean. Claudette has worked as a nurse, midwife, and in human resources for an airline company. 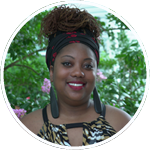 Living in Turks and Caicos, she is as dedicated to island life as she is to taking care of her family and friends. One Sunday when she returned home from church, her son A.J., who was 18 at the time, was still in bed. That was unusual for him, but Claudette made him some food hoping to rouse him. A.J. did not eat anything and returned to bed. The next afternoon, she received a phone call at work; her daughter was unable to wake A.J., Claudette rushed home from her work at the hospital. Because they lived in a remote area, the ambulance would take too long to arrive, so Claudette lifted her son into her arms. To this day she still does not know how she got the strength, and got A.J. in her car to take him to the hospital. At the hospital they discovered that they did not have the resources to treat A.J., so they med-evacuated to Nassau, the Bahamas, with Claudette, his sister, and father, following behind him on a separate flight. Claudette remembers the nurse’s words so clearly: “His eyes are fixed and dilated.” She knew it meant her son was gone. She made the decision then to donate A.J.’s organs. She knew it was the right decision. What she didn’t know was that Laurel Welch had been transported to Florida, waiting for a new liver she desperately needed. "Patients have to understand what their labs mean and how they affect their health. Too many people say that their doctor says everything is ok without understanding what that means for them." "Patients need to take control and be an advocate for themselves and their family and friends. Understanding lab results is a big part of that." "Learn as much as you can about the diagnosis, get a second opinion if warranted, and reach out to other patients with the same diagnosis." "Learning about the diagnosis is the only way you can ask the right questions." "Write a thank you note to the donor’s family, because stepping outside of yourself and saying thank you to the people who saved your life is incredibly important to help alleviate the feeling of guilt that so many donor recipients have. In my case, it provided Claudette with some relief and I was so happy I was able to give her that. The service is anonymous so we actually exchanged many letters without us even knowing each other’s name!" "Hearing from Laurel through an anonymous hospital system was incredibly helpful. If you received an organ, please reach out to the family of the deceased, even just to say thank you." "I think of A.J. as still living here, through other people right now, and I can still feel his presence. Thinking of A.J. this way has helped me tremendously." "Support groups where you can talk about the loved one you lost makes you feel you are not alone." "I wanted to hear other people’s stories and read books about other people who donated their loved one’s organs, I wish there were more available to support others going through something similar." Laurel received a liver transplant that saved her life after she was diagnosed with Hepatitis C. She received her liver through Claudette, whose son A.J. was only eighteen years old when he died from a head injury. Learn what helped both of them recover physically and emotionally from this event and what role the laboratory played in Laurel’s survival and A.J.’s ability to donate. Hepatitis C is a viral infection that attacks the liver and it causes fibrosis (also known as liver scarring). These scars prevent the liver from functioning optimally. Liver cirrhosis is advanced liver scarring, which can lead to liver failure and the need for a liver transplant. Hepatitis C begins as a blood-borne infection which infects the liver and is diagnosed through a blood test and monitored with tissue biopsies. Below is the slide the pathologist uses to confirm the diagnosis and “stage” the disease to assist clinicians in choosing treatment. A pathology slide of Hepatitis C shows clumps of dark blue cells (inflammation) within the liver, typical of this disease. 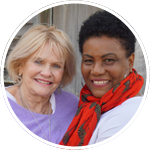 Are you interested in highlighting the story of Laurel and Claudette through a media story, event or speaking engagement? Contact Lotte Mulder at Champions@ascp.org. By sharing their stories, Patient Champions empower other patients, caregivers, and advocates to ask the right questions and understand their diagnoses, management choices and treatment options. Our Champions have all received diagnoses that changed their lives, but they survived thanks to the laboratory’s involvement in high-quality patient care. “Lab tests play an important part in the diagnosis and treatment of patients. Make sure you understand them." "I think it’s important for everybody to understand how vitally important the laboratory is in the healthcare process." "If you are a patient advocate, come to appointments with your patient with questions written beforehand. Trust the answers provided, and use those to ask about future care, treatment, or testing." "Ask questions if you don’t understand your diagnosis, treatment, or anything else related to your care." Travis first noticed something was different through the lab tests conducted as part of his annual physical. His PSA, which stands for prostate specific antigen and is measured in peripheral blood, were higher than normal. PSA tests can be used to indicate higher levels of protein in the prostate, however they do not indicate a specific diagnosis. When his levels continued to rise at his next annual physical exam, his doctor suggested a biopsy to try to find the cause of these elevated levels. Travis’ biopsy did not reveal anything, but since his PSA levels continued to rise, his urologist recommended an MRI-guided biopsy. First an MRI image is created of the prostate, that then indicates the location of a mass (if there is one). Then, a targeted biopsy is performed directly into the mass. This biopsy confirmed Travis had prostate cancer. “Receiving the diagnosis of prostate cancer was quite frightening,” says Travis. In his case, the cancer was located in an area that was difficult to feel by a physician on a rectal examination which is why it was only detected with an MRI. Thanks to continued lab tests, the cancer was found and treated. "If you do receive a diagnosis it is important to act on it timely. This is particularly true for diagnoses such as cancer. But all kinds of medical conditions are best treated when they’re treated timely." "Don’t be afraid to ask questions. There are professionals out there who are available to provide guidance and help you interpret findings such as laboratory results. If you believe there may be a problem, make sure that you do everything you can to ensure that you get to a specific answer." "It’s important for people to also understand that they should go to laboratories that are respected." Travis was diagnosed with prostate cancer after he received a second biopsy. Because of the unusual location of his cancer, the initial biopsy was negative. Thanks to laboratory tests, his team continued to follow up and after an MRI-guided biopsy, Travis received his diagnosis and was treated successfully. Learn how his entire medical team came together to properly diagnose and treat Travis. Prostate cancer is cancer located in the prostate of men. The prostate is a small gland that produces fluids and hormones related to male reproduction. Prostate cancer only occurs in men and is most common in people over 60 years of age. There are not always symptoms, so laboratory testing is essential to catch it early, especially in men with a family history of early onset prostate cancer. Symptoms may include difficulty urinating and bone pain. Image features a pathology slide of prostate cancer. Are you interested in highlighting the story of Travis through a media story, event or speaking engagement? Contact Lotte Mulder at Champions@ascp.org. Brian was diagnosed with lymphoma, a cancer caused my abnormal lymphocytes, which are a type of white blood cells that help fight infections. After doctors found a large mass in his chest through a CT scan, the mass was biopsied and the laboratory made the diagnosis. When Brian heard the news, he “was in shock for the most part, terrified.” His specific diagnosis was large b-cell lymphoma, which is a rare subtype of cancer that most often occurs in older adults. This cancer is composed of abnormal b cells, which are a type of white blood cells that produce antibodies. It is an aggressive type of cancer and Brian was diagnosed at stage 3, meaning the cancer had spread to some nearby lymph nodes but not to any other organs. Brian received chemotherapy and after 5 treatments, no lymphoma was found on a PET scan (a special type of imaging that visualizes cancer). He then received 20 rounds of radiation. After an additional PET scan showed a spot of lymphoma on a rib, he received 20 additional rounds of radiation. Brian has been in remission since April of 2016 and receives a CT scan every six months as part of his follow-up care. “My wife and daughter have had as much of an effect on my recovery as my doctors, friends, and the rest of my family. It was very humbling to see everyone around me come together for support,” says Brian. Riding bikes with his daughter is one of his favorite activities and it makes him incredibly happy that he can do that again. "That you have a right to know your results and understand those results in full." "Ultimately, trust your doctors and their treatments, but do not be afraid to question them or to ask for further testing if something health related is not right." "Take notes and try to be on the same page as the doctors." Brian was diagnosed with large b-cell lymphoma, a cancer located in a type of white blood cell that produces antibodies. He is currently in remission and being closely monitored to catch a possible reoccurrence early on. Lymphoma is a cancer caused by abnormal cells from bone marrow, which produces all of the disease-fighting cells of the body. B-cell lymphoma originates from B-cell-type white blood cell (the “b” is for “bone marrow” where these cells normally mature) and produce antibodies. It is an aggressive type of cancer that typically occurs in older adults, but not always. Image features a typical image of large b-cell lymphoma, which is more aggressive, is shown with variation in size, shape, and coloration of the cells including very large cells. Are you interested in highlighting the story of Brian through a media story, event or speaking engagement? Contact Lotte Mulder at Champions@ascp.org. 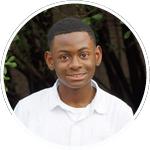 Malik was diagnosed with sickle cell disease during routine blood tests as a newborn. His mother, Belinda, knew she had the sickle cell trait, so she thought the same would be true for Malik. However, when both parents have sickle cell trait, each child has a 25% chance of getting the disease. When Belinda heard the diagnosis, she was devastated. “I did not know what to do. I really lost hope,” says Belinda. Malik would be in so much pain, and it was heartbreaking to hear that her first son would suffer so much in his life. "Lab tests play an important part in the diagnosis and treatment of patients. Make sure you understand them." "Don't give up, especially during the hard days. Find people you can reach out to and ask for help." "Advocacy is very important, especially when patients can't fight for themselves. I've had many days of my life that seemed like it wouldn't be possible for me to go on. My family and friends carried me through. It may sound like a cliché but, every day is a brand new gift." Malik (left) was born with sickle cell disease but thanks to a bone marrow transplant from his younger brother, Michael (right), Malik is cured. Sickle cell disease is a genetic condition in which red blood cells take the shape of a sickle and are rigid and unbending (unlike regular red blood cells). These cells die ten times faster than regular blood cells, which leads to anemia. When too many cells are sickle shaped (and rigid) due to a sickle crisis, pain occurs because the rigid cells clog the flow of blood in small vessels. About three million people in the United States currently have sickle cell trait, which means they have the defective gene, but not the disease. If both parents have the trait, there is a 50% chance their child will also have the trait, and a 25% chance their child will have the disease. This pathology slides is a peripheral blood smear from a patient with sickle cell disease demonstrating many elongated red cells with tapered ends, typical of "sickled" cells. In addition to these shapes, these sick cells are rigid, which makes them block and clog small vessels. Are you interested in highlighting the story of Malik through a media story, event or speaking engagement? Contact Lotte Mulder at Champions@ascp.org. When Anthony was 22 years old, he was experiencing extreme fatigue, so he visited the ED. He was surprised to learn he had “horseshoe kidney,” a condition where the kidneys fuse together into a horseshoe shape during fetal development in the womb. Which had an effect on his blood pressure. He never expected he would have to travel the road of dialysis much less expected to hear he would eventually need a kidney transplant. "I was overwhelmed when I heard my diagnosis," says Anthony. He was closely being monitored, taking medication along with dialysis, checking his blood results monthly and keeping his blood pressure under control to prevent any complications from arising prior to his kidney transplant. Within four years of starting dialysis he had an opportunity to receive a transplant. He received the transplant in April of 2017, when his wife was eight months pregnant with his son. The transplant was successful and two weeks later, Anthony became a father. "I realize now that every day is a gift and I am more intentional with what I do each day," says Anthony. Anthony's kidney disease is genetic. Because he was adopted, he did not know his chances of being diagnosed with this disease. Anthony is monitoring his children closely through lab tests in case they start to show symptoms as well. He wants to protect them, so he is continuing to research and learn about his diagnosis and developments in the laboratory science field. "Always look at your lab results. If there is something you do not understand, do research or ask your doctor. Having that kind of clarity and understanding is vital in your health care because it allows you to be empowered and to make the decisions that are right for you." "Work to stay positive and utilize your mind in a manner that will benefit you and those around you." "Get involved with care support organizations that can help you guide, cope, and overcome your diagnosis." 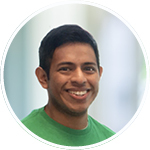 ASCP is sharing Anthony's story in collaboration with the National Kidney Foundation to showcase the medical laboratory’s key role in a chronic kidney disease patient’s journey from diagnosis to successful transplant. Anthony was diagnosed with horseshoe kidney at 22 years old. He was told he needed go on dialysis immediately and look at getting worked up for a kidney transplant, which was his best option. Four years later, he had that opportunity. At the age of 25 he received a kidney from his sister-in-law, who happened to be a perfect match. Anthony received his new kidney two weeks before his son was born. He not only felt he was given a second chance, but he also started his new life as a father. The name says it all; horseshoe kidney is when both kidneys fuse together and form a horseshoe shape. This typically occurs in the womb, but it is not always diagnosed until later in life. It is diagnosed by doing an ultrasound in the radiology department. Symptoms include kidney stones, urinary tract infections, and pain when urinating. Laboratory tests show how well kidneys are working and can indicate if an ultrasound is needed. Emily knew she wanted to be a mother ever since she was a little girl. After she and her fiancé, Nate, were married, Emily’s dream of starting a family became a real and exciting prospect. Yet, after three years, she was unable to become pregnant. Yet she persevered and looked at In-Vitro Fertilization, or IVF. After learning more about the process, Emily and Nate decided to give it a shot. After some preliminary tests and some failed attempts, the last two of Emily’s viable eggs were incubated, fertilized, and transplanted into her body. Waiting to see if the transplantation would be a success is one of the toughest and most exciting parts of the IVF process. Emily went to the doctor, where the laboratory processed a blood test and the results were in. She was pregnant—with twin girls! Her journey of starting a family had finally begun. Emily’s pregnancy was closely monitored through additional lab tests during her pregnancy. Ella and Evie were born prematurely, at 24 weeks and six days. Although it is not uncommon for twins to be born prematurely, Emily gave birth earlier than most cases of premature twins. With the twins being born as prematurely as they were, this was a scary and uncertain time for Emily and Nate. However, like their mother, the twins persevered through their medical adversity and stayed in the NICU for 107 days. During that period, the laboratory played a crucial role in monitoring Ella’s and Evie’s development. Many lab tests were run, which supported the girls’ medical team in ensuring the twins got everything they needed to become strong and healthy. And, that’s exactly what happened. Now, Ella and Evie are happy and healthy babies! Ella looks like her mom and shows signs of having her dad’s personality. Evie looks like her dad and has developed more of her mom’s personality. Emily and Nate have the best of both worlds and are elated to be able to love and parent both girls. 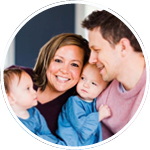 As it turns out, the IVF scientific process and the laboratory fulfilled Emily’s lifelong dream of becoming a mother and starting the family that she had always hoped for. "Never give up. Don’t let a diagnosis get in the way of achieving your dreams." "Explore what your options are and consider them as seriously as your desire to make your ideal outcome happen. Ask for second and third opinions." "Talk through your results and how you should interpret and understand them.Share your anxieties, feelings, and concerns with your medical team so that they can address them." "Don’t be afraid to ask too many questions. If it’s important in helping you understand your diagnosis, it’s an important questions." IVF stands for In-Vitro-Fertilization and refers to when an egg is fertilized through a medical procedure outside of the body. After incubation, viable fertilized eggs are implanted into the woman’s uterus and she waits to receive a positive pregnancy test. Typically, IVF has a success rate of 20-35%. Are you interested in highlighting the story of Emily through a media story, event or speaking engagement? Contact Lotte Mulder at Champions@ascp.org. Pathology is the study of disease using body tissue and cells. This study, performed by pathologists—medical doctors who specialize in pathology—can be performed by examining tissues with the naked eye, examining stained cells with a microscope, or analyzing the cellular or chemical composition of body fluids. Pathologists work with other members of the medical laboratory team (pathologists’ assistants, clinical laboratory scientists, and phlebotomists), as well as the clinical care team (physicians, nurses, radiology, and pharmacy) to provide diagnoses which determine treatment plans and care options. Analysis of blood and body fluids. Interpretation and explanation of laboratory test results. Teaching medical students, participating in tumor boards, and otherwise acting as the “doctor’s doctor”. As our healthcare system moves toward personalized medicine, pathologists’ visibility as part of the multidisciplinary healthcare team is increasing. They are vital in advising clinicians and patients about treatment options based on a personalized approach to diagnosis. Follow the link if you want to learn more about pathologists and laboratory professionals. The Patient Champions program raises awareness of the vital role the medical laboratory plays in patient care by highlighting real-life stories of patients—our Patient Champions. By sharing their stories, Patient Champions empower others to ask the right questions to better understand their diagnoses, management choices, and potential treatment options. Have questions or want more information? Contact us via the form below. Founded in 1922 in Chicago, ASCP is the world’s largest professional membership organization for pathologists and laboratory professionals. ASCP provides excellence in education, certification, and advocacy on behalf of patients, anatomic and clinical pathologists, and medical laboratory professionals. Click below to learn more about ASCP, including our members, resources, and community efforts. The Patient Champions Advisory Board is comprised of pathologists, laboratory professionals, and public members who collaborate with the ASCP Patient Champions team to shape the vision and strategy of the Patient Champions program. Board members evaluate Patient Champions applications, determine potential partner organizations, identify events and conferences to help promote our Champions, and advocate for the program. If you are interested in joining the Patient Champions Advisory Board, please fill out the form below. Patients are at the core of health care; without patients, there is no healthcare. Though it can be tough to receive a diagnosis, patients and their caregivers can take control of their treatment by understanding their diagnosis and care options. Patient Champions advocate for themselves and are sharing what they have learned to empower other patients, caregivers, and advocates. If laboratory tests have helped you manage an illness or supported your recovery, we want to hear your story! Share your story with us by filling out the form on this page to inspire and empower patients, caregivers, and advocates. By sharing your journey, you can help others as they navigate the often challenging road of diagnosis, management, and recovery. An opportunity to support patients and caregivers by demystifying the diagnosis and treatment process. Free media and presentation training to build their communication skills abelownd help them talk about their treatment. The experience of sharing their stories through interviews with journalists and bloggers, public speaking engagements, and more. Champion Kya (top) with her Mom Connie (bottom), laboratory professional, who taught her how to read and understand lab results. If you are interested in sharing your story, fill out the form below. 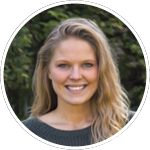 Lotte Mulder, ASCP’s Senior Manager of Organizational Leadership and Patient Engagement, will contact you! Empowered patients who understand their diagnosis and treatment plans feel more in control of their situation and are able to make educated decisions. Help us reach more patients and caregivers by promoting our Champions and their stories. You can follow us on Instagram and Facebook and like, share, and forward our posts and videos. You can also download our promotional materials and share them within your community. You can also email us to request a media kit, send us media contacts and partnership opportunities, or cohost a patient advocacy event with us. Please contact Lotte Mulder prior to promoting the Champions to coordinate efforts with ASCP. You can email her at Champions@ascp.org or call her at 312-541-4757. Nam (ASCP), Champion Erin, and Lotte (ASCP) at Erin’s home. Use our promotional materials and flyers to educate and empower patients and caregivers around the world! If you are interested in the ASCP Patient Champions Program and would like additional information, please fill out the form below. If you would like to contact an ASCP Patient Champion for an interview or speaking engagement, please fill out the form below. Our Champions have been diagnosed with a variety of illnesses: breast cancer, thyroid cancer, leukemia, Ewing sarcoma, aplastic anemia, hepatitis C, Crohn’s disease, Behçet's disease, and more. They have received multiple treatments and surgeries, including liver, kidney, and bone marrow transplants; chemotherapies; and medications. Our Champions are passionate about sharing what they have learned on their journeys and about the laboratory with others. You can learn more about each Champion by clicking below. Patient Champions Team Nam (far left) and Lotte (far right) with Champions Erin, Deedee, and Cindy at ASCP’s Presidents Dinner, Chicago, 2017. What are Champions expected to do? Because we share Patient Champions' stories through interviews, blogging, social media, and speaking engagements we encourage our Champions to be actively engaged in helping to promote their story and to be interested in helping others learn from their experience through interviews and potential speaking engagements. Is there a time requirement to be a Patient Champion? We do not ask for a specific time commitment to become a Champion. Will Champions receive compensation if selected? The ASCP Patient Champions program is a volunteer opportunity for those with the desire to empower and support patients, advocates, and caregivers. While Champions do not receive monetary compensation, they will be reimbursed for any travel expenses. Are there any criteria to share my story as a Champion? Anyone can share their story! However, in order for us to share your story through our program, we look for Champions that have been diagnosed relatively recently and who's laboratory results played a role in either the diagnosis or the management of your illness. If you are under 18 years of age, we ask that your legal guardian complete the form. Are there any disclosures and liability forms Champions need to sign? All information shared in the Share Your Story form is provided voluntarily. That information will only be available to internal staff working on this program. Once you have become a Champion and you agree to share your story through the ASCP Patient Champions program, we will ask for a signed release form. What happens after filling out the Share Your Story form? Once you have submitted your story, you will receive a confirmation email. We will read your story and Lotte Mulder, ASCP’s Senior Manager of Organizational Leadership and Patient Engagement, will reach out to you. How will the information submitted in the Share Your Story form be used? This information will be shared with select ASCP staff. If we would like to use this information beyond this purpose, we will ask you to to sign a consent form. October 3, 2018, 6 - 7 p.m.
An ASCP Patient Champions Education and Networking event at the ASCP Annual Meeting 2018. Receiving a serious diagnosis can be life changing. Patients and their advocates can take better control of their treatment and care options by learning everything they can about their diagnosis, including understanding their laboratory and pathology results. Empowered patients are essential to creating optimal health care. The Learn How the Lab Can Save Your Life event focuses on empowering patients and patient advocates by educating these groups about the laboratory in order to discern their available treatment options and choose the plan that works best for them. The American Society for Clinical Pathology (ASCP) will host this inaugural event during their Annual Meeting 2018 in Baltimore, MD at the Baltimore Convention Center. The event will be during the opening reception, from 6:00-7:00 p.m. Patients and patient advocates are welcome to attend the entire first day of the conference free of charge. Have questions? Contact Lotte Mulder. There are many ways to participate with the ASCP Patient Champions program, and we invite you to get involved and start a conversation about the best fit for your organization’s needs and goals. Bring your staff, patient advocates, patients, caregivers, family and friends! We will provide free registration for people you want to bring to the Learn How the Lab Can Save Your Life event. Participate by exhibiting for free at the ASCP Annual Meeting in our Patient Champions section. Please note there are limited booths and are only available on a first come, first serve basis. Particpate by facilitating a lecture on patient advocacy and education. Particpate by sponsoring the event or specific aspects of the event, such as food, lectures or booths. Limited sponsorships are available. To get involved or to help spread awareness, please contact Lotte Mulder below or call 312-541-4757. ASCP could not have created the Patient Champions program without the hard work, support, and guidance from our partners, sponsors, and supporters. Co-authoring articles about patient advocacy. Co-creating educational and advocacy events. If you’re interested in partnering with us to educate and empower patients, please fill out the form below. This program raises awareness of the vital role the medical laboratory plays in patient care through real-life stories of patients. Patient Champions empower new patients to ask the right questions and understand their diagnoses by sharing their stories.